Rhododendrons and azaleas will grow and thrive without fertiliser, however the use of fertiliser in the first two or three years will generally make for more healthy and stronger plants. A proprietary acid fertiliser applied in early spring at about 1 tablespoon per 30cm of height, sprinkled over the root area and washed in, will be sufficient. Dwarf varieties growing in ideal soil conditions require little or no fertiliser. FERTILISERS Incorporate fertiliser into your planting hole at the time of planting. It is more accessible to the roots, rather than spreading it on top of the soil after planting. For average leaf sized rhododendrons, we recommend you use a standard Azalea-Camellia rhododendron fertilizer such Yates Thrive or Nitrophoska Blue. When planting dwarf rhododendrons, evergreen azaleas and containerised plants it is best to use a slow release product e.g. Cross Hills Long-Life fertiliser. Click here to order your fertilisers - then scroll down to ORDER your preferred fertiliser product. Have any of your plants got silver leaves? If they have, then read on. 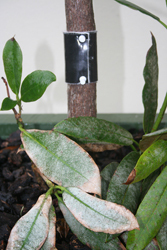 The ‘silvering’ on the leaves of your plant is actually chewing damage done by thrips. Unfortunately this damage is permanent. Treatment has to start after flowering to prevent damage to your new season’s leaves. Using our Tree Health Bands is an easier way to rid your larger trees of sucking insects such as thrips and scales. Only one application per year is all that is required. The best application time is spring through to early summer when the trees are actively growing. Tree Health Bands eliminate the time consuming task of spraying and the possible drift of spray into neighbouring properties. Spraying is still probably the most practical way to treat trees smaller than one metre in height. Our Tree Health Bands only work with systemic chemicals and Cross Hills SUPER THRIPS KILLER is the preferred one, but if you garden organically SUPER NEEM TREE OIL can be used. Select view item to see more information. Each metre of band will treat up to five trees depending on the diameter of the tree trunk. One bottle of SUPER THRIPS KILLER is sufficient for several metres of Tree Health Band. After measuring and cutting off the length of band required, the recommended amount of chemical is poured along the length of the band. It is then pinned around the stem as shown in the photo and should be left on the tree for at least 4 weeks, during this time capillary action disperses the chemical throughout the tree. At the end of the four-week period the bands must be removed and can be either recharged with chemical and applied to other trees, or stored for future use. Tree Health Band packs contain chemical resistant gloves, pins for attachment to trees and full instructions. We can put a Tree Health Band pack and the chemical of your choice in with your plants, which saves separate freight costs and you will have it on hand to apply later in the spring. Alternatively we can post the products as required. This treatment is not suitable for fruit or nut trees because the chemicals are absorbed into the sap stream and consequently into the fruit. Full instructions are supplied with each pack – the Tree Health Bands are available in 1 metre and 5 metre lengths.